Alfaparf Semi Di Lino illuminating Hairspray. An extra fine fixing hairspray, ideal to give support to all styling. It creates a reflective "shine shield" that guards against humidity and frizz, whilst giving a firm hold. A weightless and build up-free formula including an ultra-fine, vaporizing mist for even spray pattern. Brushes out easily. 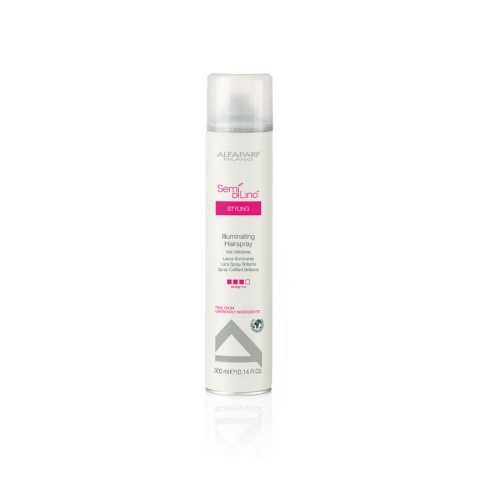 Directions: spray onto dry hair after styling , at a distance of about 25-30 cm. A very good hairspray. Strong hold without being sticky. I have used it for several years and it's the nicest one I have found.